Chapter 5 identifies the primary cultural challenges as well as solutions for strengthening trust-building and motivation during the project collaboration process, from creation to execution. Achieving alignment with teams across geographies can be a challenging task, in addition to ensuring effective communication with geographically distributed teams. 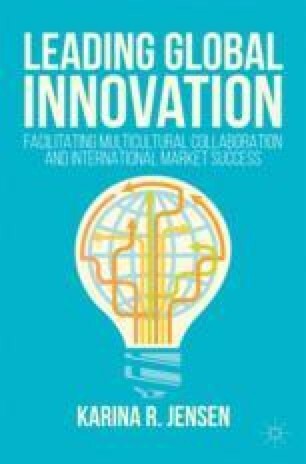 Readers will learn how leaders and teams can promote a positive dialogue for sharing local market knowledge and new ideas. This chapter also discusses the importance of integrating face-to-face communication with knowledge platforms that harness and diffuse team knowledge worldwide. Cases from Essilor and Adobe show how organizations are facilitating dialogue and multicultural collaboration across geographies. Company overview, BMW Group: https://www.bmwgroup.com/en/company.html. Accessed on December 10, 2016. Company profile, Mazda: http://www.mazda.com/en/about/profile/library/. Accessed on December 10, 2016. Embracing Innovation: Case Study, “Inside high: Mazda’s Seita Kanai on innovation and branding strategies”, PwC: http://www.pwc.com/gx/en/services/advisory/consulting/revitalizing-corporate-japan/embracing-innovation-case-study-inside-high.html. Accessed on December 10, 2016. Steep, Mike. “How to Create Innovation Cultures That Keep Working”, Forbes Leadership Forum, Forbes, September 3, 2014: http://www.forbes.com/sites/forbesleadershipforum/2014/09/03/how-to-create-innovation-cultures-that-keep-working/#4c49381397ca.